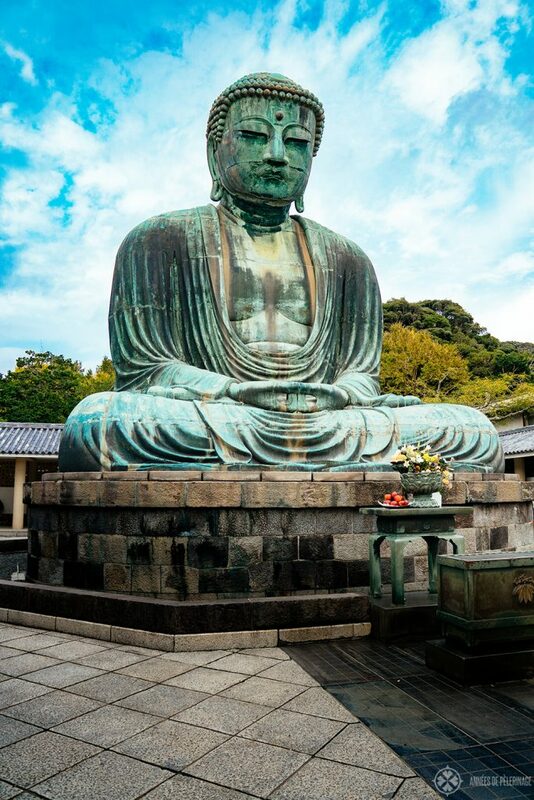 The Kamakura Daibutsu, or Great Buddha of Kamakura, is one of the most iconic landmarks in Japan. 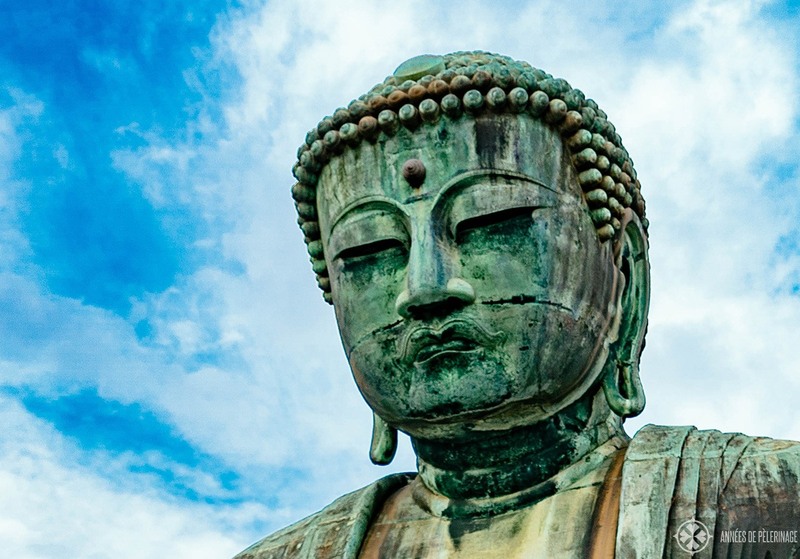 Built in 1252 AD, the gigantic Amitabha Buddha draws hundreds of thousands of tourists each year to marvel at the second tallest bronze Buddha statue in Japan. It certainly is one of the best things to see in Kamakura (check my full list here), even though there is not much more to see at Kotoku-in temple. You see, the Daibutsu was once sitting inside a huge wooden hall (much like in Nara). Frequent earthquakes repeatedly destroyed the hall throughout its long history, though. Ever since 1498, the Great Buddha is standing in an open courtyard, the way you can see it now. In 1879 another attempt was made to raise money for the reconstruction of the hall, but the money was ultimately used to enlarge the temple grounds. The gardens, while beautiful, are not particularly noteworthy, and neither is the roofed colonnade around the great Buddha. 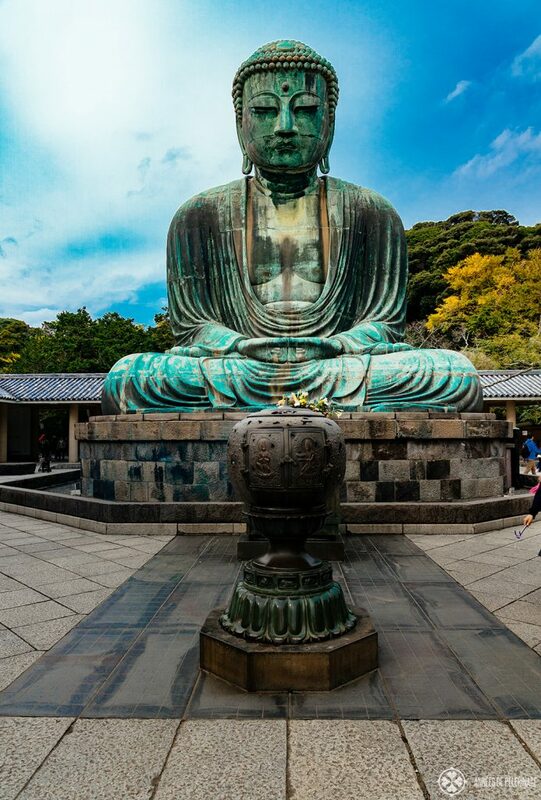 Unlike many other great Buddha statues throughout Japan (and Asia), the Kamakura Daibutsu is meditating. You can clearly see his hands resting in his lap (Dhyana-Mudra), whereas the Great Buddha in Nara (nara daibutsu) is raising his hands in greeting. The Kamakura Daibutsu is said to be created by the sculptors Ono-Goromon and Tanji-Hisatomo at the request of the Lady Idanonotsubone and the priest Jōkō. There is little archeological evidence that this is true, but there are some secondary temple records pointing towards that story. There are also some rumors that there was a wooden statue predating the current bronze statue. 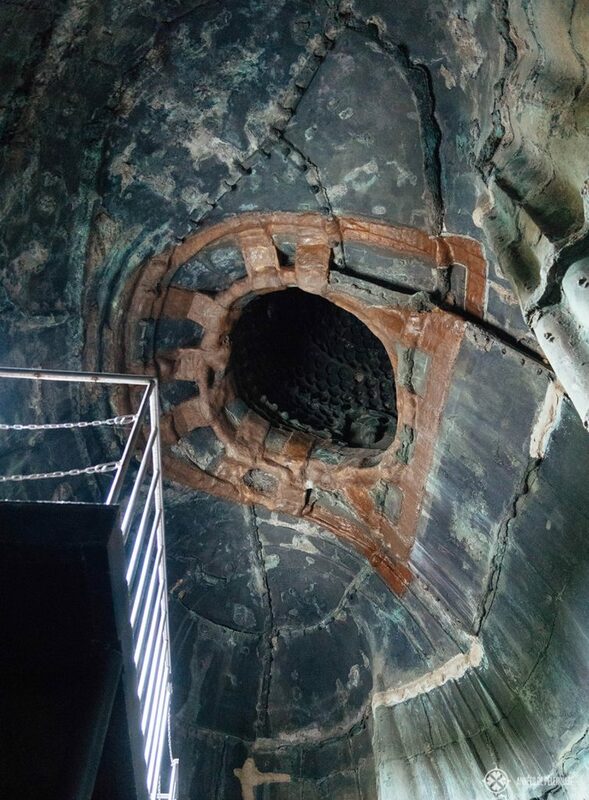 It is possible to view the interiors of the Great Buddha. 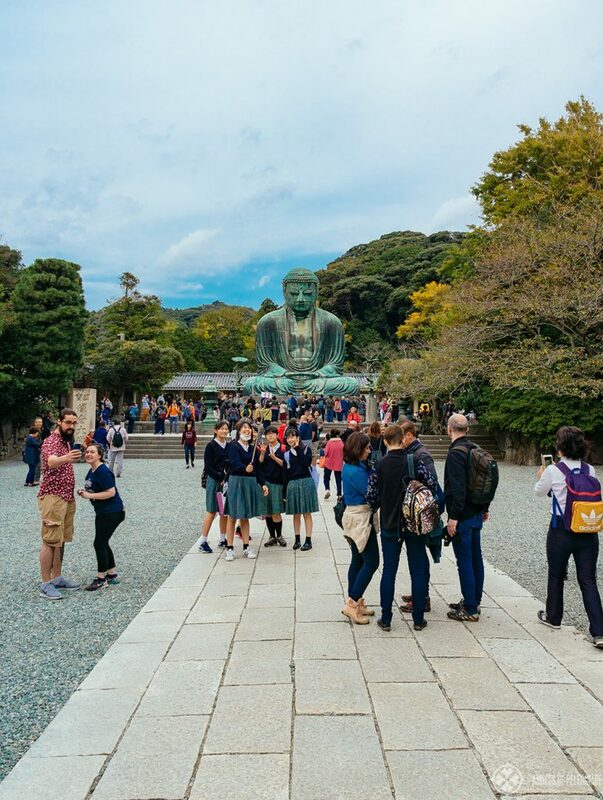 Contrary to what you might think, the Kamakura Daibutsu is hollow within. You can even see two windows on the back of the statue. Now, I want to be honest with you: It’s not exactly spectacular within. It’s just…well a hollow statue and some old graffiti. But as the entrance fee is only 20 yen, it’s worth the little wait to get inside. You can even see the plastics applied to reinforce the neck of the statue in between 1959 and 1961. Note: Only 30 people may enter the statue at once and only authorized persons can climb the stairs inside. The most popular way to get to the Kamakura Daibutsu is probably taking the Enoshima Electric Railway (Enoden). 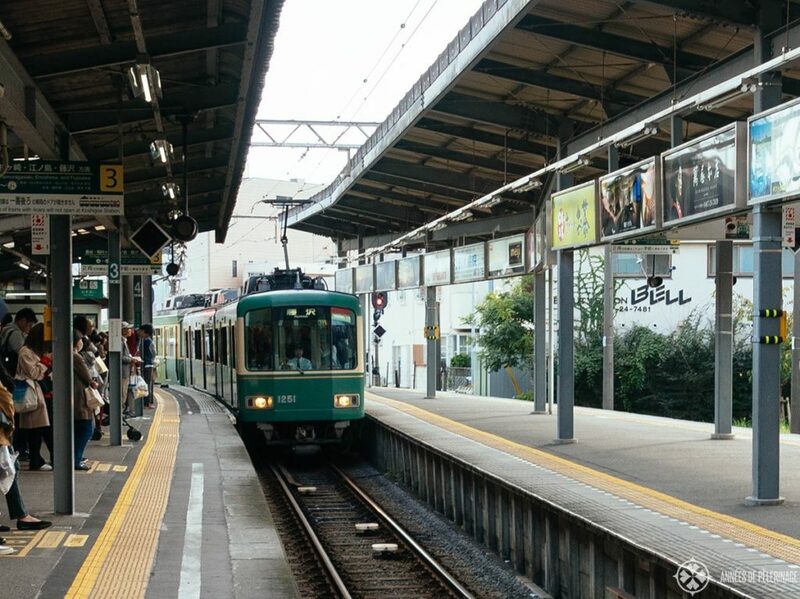 You will probably arrive via train from Tokyo anyway, and thus you really just need to change train lines at the main station (you sort of have to walk out of the building and around it, as the Enoshima Electric Railway is not operated by JR). Get out at Hase-Station and follow the signs from there. You can also take the Enoshima-dentetsu bus and get off at Daibutsu-mae, which will also take roughly 10 minutes. Just remember to take the East Exit of Kamakura station. The Keikyu Bus also stops at Daibutsu-mae. Which is better? Well, I’d recommend you to get the Enoden 1-Day Pass ticket and visit all the attractions along the scenic train route. If you just want to see the Buddha, then the bus is probably more convenient. Naturally, you can also take a taxi. Note: Don’t forget to check out my guide to planning a day trip from Tokyo to Kamakura. Like all temples in Japan, Kotoku-in also closes rather earlier. Last admittance is always 15 minutes before closing time. If you want to see the interior of the Great Buddha, then you should be aware that opening hours differ a little: 8:00 am until 4:30 pm throughout the year. There are no group admission rates any longer and all adults will have to pay the same entrance fee. Only children under six get in for free. 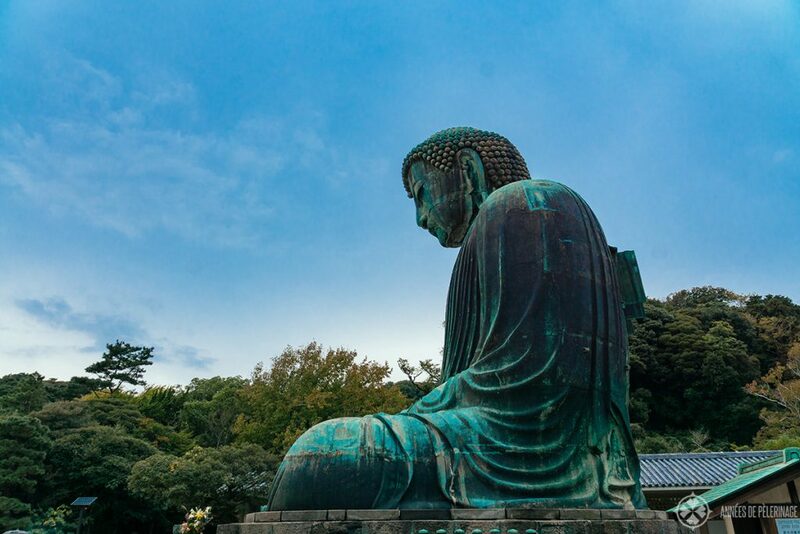 Is it worth visiting the Kamakura Buddha? I want to be quite truthful with you. The Kamakura Buddha looks amazing on pictures, but in real life, it is somewhat underwhelming. Or rather, it looks so overwhelmingly majestic on pictures, but when standing in front of it, it’s just a 12-meter high statue. 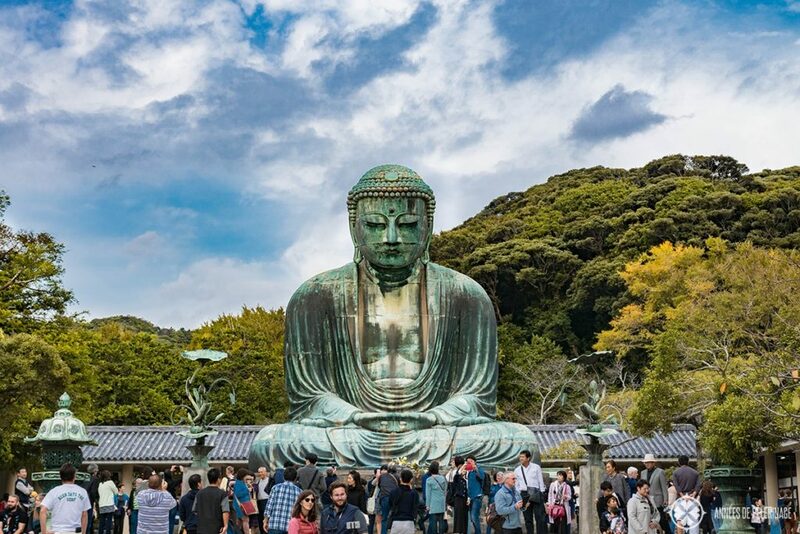 As Kamakura is one of the 5 best day trips from Tokyo, and there is so much more to see in the birthplace of the Samurai, it’s definitely worth the detour. 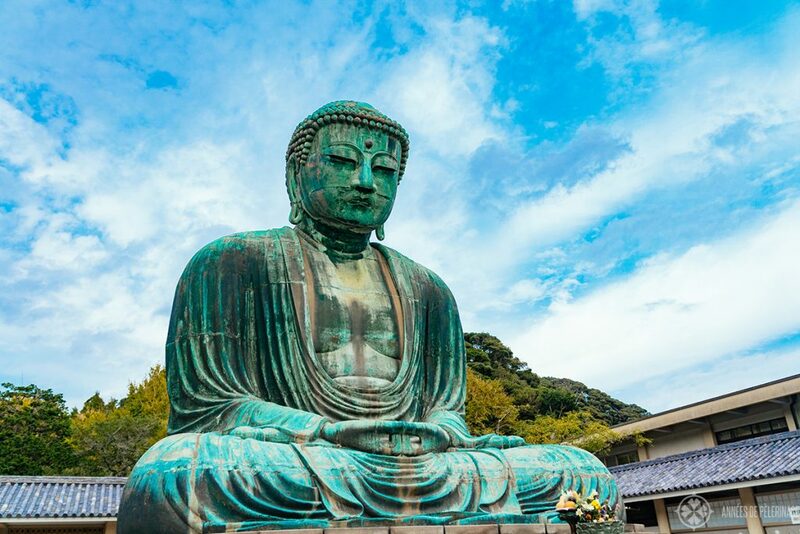 Why is the great Buddha of Kamakura important? It is a prime example of the so-called Kamakura period, which started the rule of the Samurai / Shogunate in Japan. But it is also important for another reason. 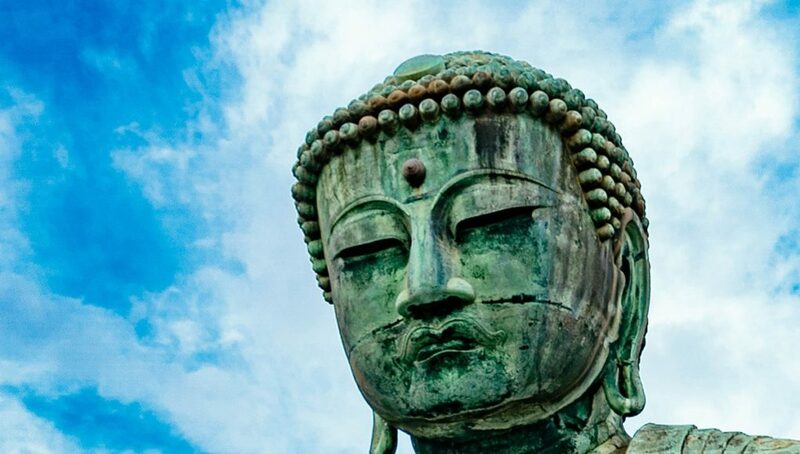 The Buddha statue was created using a new casting method called “ikarakuri“. Instead of in one piece, the Kamakura daibutsu was cast in 30 separated stages, by placing the different molds on top of each other. Quite a novelty back then. If you take a close look, you can see the individual seems between the different part – especially from inside. 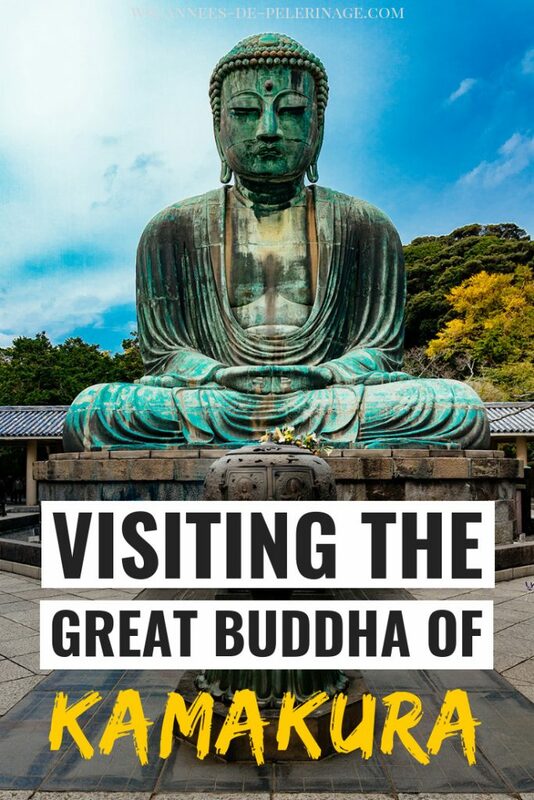 So, this was my little guide to the Great Buddha of Kamakura. Hope I was able to show you what to expect and how to visit.